Disregarding a 10-year hiatus, British death metal stalwarts Carcass have been unleashing riffs and assaulting the senses since the 1980s. They've evolved a lot over decades, helping pioneer more than one new metal genre along the way, and now they seem hell-bent on continuing their recent resurgence. At Heavy Montreal on Saturday (August 6), they had just 45 minutes to surgically shred the faces off thousands of avid fans at the Heavy Stage. The days of their earlier, gory, 100-second tracks seem a relic of the past, at least on their current, One Foot in the Grave tour. Perhaps it was a good thing for the people at the periphery of the crowd stuffing hotdogs into their mouths, but for a band so influential in pioneering goregrind back in the day, it sure would have been amazing to hear some choice "cuts" from 1988's Reek of Putrefaction. Despite this, incredibly thick, glorious riffs and gut-wrenching vocals flailed from the stage, splattering the ravenous crowd below. 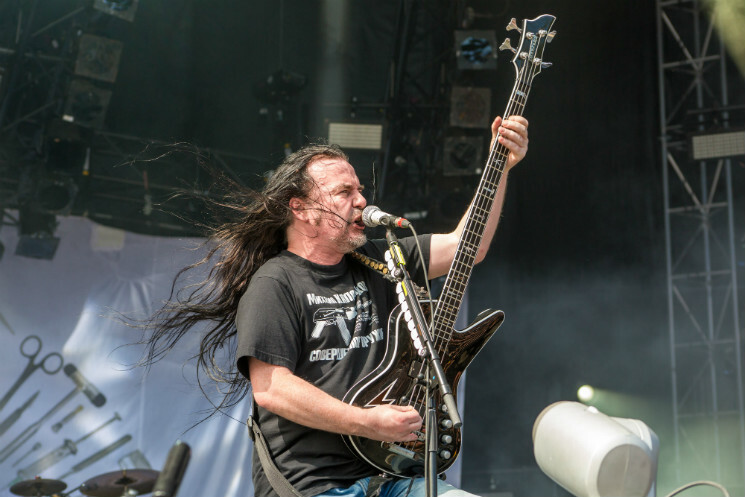 Carcass demonstrated with razor-sharp execution that they are still as tight and powerful live as they have ever been in the studio. The band's 1993 breakthrough album Heartwork, the masterpiece on which they helped pioneer the melodic death metal genre, was represented by two of their best performances on the day; both the title track and the mesmerizing "Buried Dreams" had the mosh pit undulating at their feet. An incredible performance of "The Granulating Dark Satanic Mills" from their latest release, 2013's Surgical Steel, was one of the best performances at the entire day of the festival and helped reinforce that their new material is just as relevant and devastating as what they've done in their accomplished past.